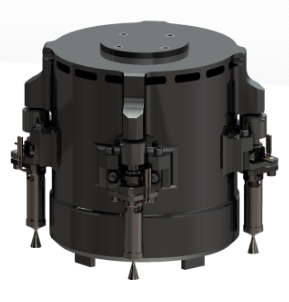 MPS-130™ CubeSat High-Impulse Adaptable Overview MPS-130™ CubeSat High-Impulse Adaptable Modular Propulsion System (CHAMPS) is a 1U AF-M315E (low-toxicity propellant) propulsion system that provides both primary propulsion and 3-axis control capabilities in a single package. The system is designed for CubeSat customers needing significant ΔV capabilities including constellation deployment, orbit maintenance, attitude control, momentum management, and de-orbit. [Satnews] Aerojet Rocketdyne, a subsidiary of Aerojet Rocketdyne Holdings, Inc. (NYSE:AJRD), has entered a public-private partnership with NASA to mature the development of an MPS-130 CubeSat propulsion system using a green propellant, known as AF-M315E. Once fully developed, not only would the technology increase in-space CubeSat mission capabilities, but AF-M315E would provide a safer, more efficient and higher performance alternative than traditional hydrazine propellants. The MPS-130 green propulsion system will allow CubeSats and nanosats to increase their capabilities similar to those of much larger satellites, such as extending mission life, increasing architecture resiliency, maneuvering to higher and lower orbits, and performing complex proximity operations and formation flying. Under the partnership, Aerojet Rocketdyne will deliver a fully integrated MPS-130 green propulsion system for flight demonstration, as well as conduct development and validation testing. Aerojet Rocketdyne was selected for this project under NASA’s “Utilizing Public-Private Partnerships to Advance Tipping Point Technologies” solicitation, which seeks to mature technologies beyond their “tipping point.” According to NASA, the goal is to enable private industry to develop and qualify the technologies for market, stimulating the commercial space industry while delivering technologies and capabilities needed for future missions and commercial applications.